Hungary-based design team Urban Landscape Group recently completed an extraordinary summer project that allows visitors to float down the Danube in a portable pool! 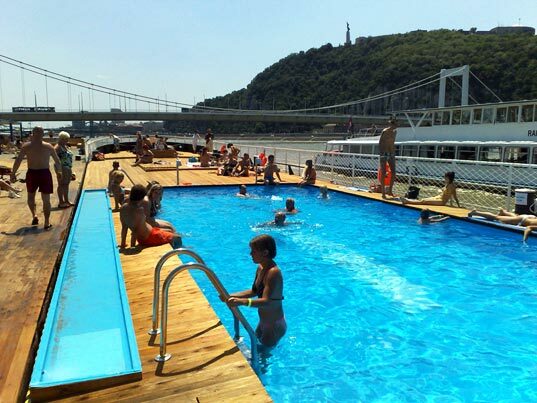 Dubbed Barge Beach Budapest, the sandy sailing island acts as a contemporary Turkish bath and open air pool situated in the waterways between the river’s edges. The pop up beach is constructed from three recycled barges and provides residents with a brand new public space to bask in the sun. Barge Beach Budapest is composed of a wooden deck that sits atop three recycled barges that at one time carried shipments of coal and stone up and down the river. The 2,100 square-meter platform comes complete with a 16-meter pool surrounded by lounge chairs, outdoor showers, a café and bar, as well as sand pits and a paddling pool for kids. Hungary-based design team Urban Landscape Group recently completed an extraordinary summer project that allows visitors to float down the Danube in a portable pool! 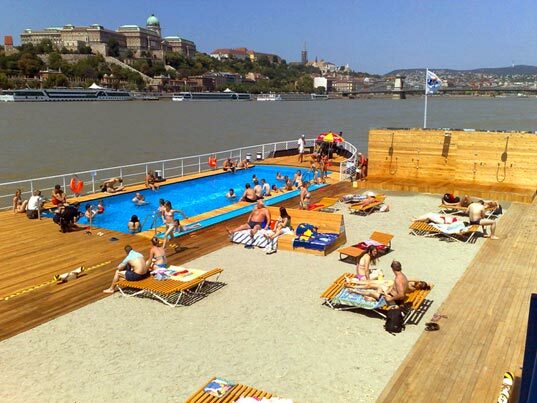 Dubbed Barge Beach Budapest, the sandy sailing island acts as a contemporary Turkish bath and open air pool situated in the waterways between the river's edges. The pop up beach is constructed from three recycled barges and provides residents with a brand new public space to bask in the sun.